Not to be confused with Curved line. 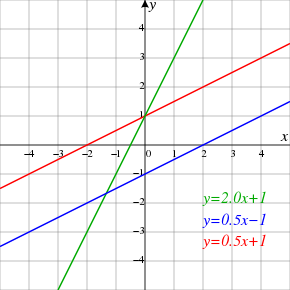 The red and blue lines on this graph have the same slope (gradient); the red and green lines have the same y-intercept (cross the y-axis at the same place). A representation of one line segment. The notion of line or straight line was introduced by ancient mathematicians to represent straight objects (i.e., having no curvature) with negligible width and depth. Lines are an idealization of such objects. Until the 17th century, lines were defined as the "[…] first species of quantity, which has only one dimension, namely length, without any width nor depth, and is nothing else than the flow or run of the point which […] will leave from its imaginary moving some vestige in length, exempt of any width. […] The straight line is that which is equally extended between its points." Euclid described a line as "breadthless length" which "lies equally with respect to the points on itself"; he introduced several postulates as basic unprovable properties from which he constructed all of geometry, which is now called Euclidean geometry to avoid confusion with other geometries which have been introduced since the end of the 19th century (such as non-Euclidean, projective and affine geometry). In modern mathematics, given the multitude of geometries, the concept of a line is closely tied to the way the geometry is described. For instance, in analytic geometry, a line in the plane is often defined as the set of points whose coordinates satisfy a given linear equation, but in a more abstract setting, such as incidence geometry, a line may be an independent object, distinct from the set of points which lie on it. When a geometry is described by a set of axioms, the notion of a line is usually left undefined (a so-called primitive object). The properties of lines are then determined by the axioms which refer to them. One advantage to this approach is the flexibility it gives to users of the geometry. Thus in differential geometry a line may be interpreted as a geodesic (shortest path between points), while in some projective geometries a line is a 2-dimensional vector space (all linear combinations of two independent vectors). This flexibility also extends beyond mathematics and, for example, permits physicists to think of the path of a light ray as being a line. All definitions are ultimately circular in nature since they depend on concepts which must themselves have definitions, a dependence which cannot be continued indefinitely without returning to the starting point. To avoid this vicious circle certain concepts must be taken as primitive concepts; terms which are given no definition. In geometry, it is frequently the case that the concept of line is taken as a primitive. In those situations where a line is a defined concept, as in coordinate geometry, some other fundamental ideas are taken as primitives. When the line concept is a primitive, the behaviour and properties of lines are dictated by the axioms which they must satisfy. In a non-axiomatic or simplified axiomatic treatment of geometry, the concept of a primitive notion may be too abstract to be dealt with. In this circumstance it is possible that a description or mental image of a primitive notion is provided to give a foundation to build the notion on which would formally be based on the (unstated) axioms. Descriptions of this type may be referred to, by some authors, as definitions in this informal style of presentation. These are not true definitions and could not be used in formal proofs of statements. The "definition" of line in Euclid's Elements falls into this category. Even in the case where a specific geometry is being considered (for example, Euclidean geometry), there is no generally accepted agreement among authors as to what an informal description of a line should be when the subject is not being treated formally. When geometry was first formalised by Euclid in the Elements, he defined a general line (straight or curved) to be "breadthless length" with a straight line being a line "which lies evenly with the points on itself". These definitions serve little purpose since they use terms which are not, themselves, defined. In fact, Euclid did not use these definitions in this work and probably included them just to make it clear to the reader what was being discussed. In modern geometry, a line is simply taken as an undefined object with properties given by axioms, but is sometimes defined as a set of points obeying a linear relationship when some other fundamental concept is left undefined. In an axiomatic formulation of Euclidean geometry, such as that of Hilbert (Euclid's original axioms contained various flaws which have been corrected by modern mathematicians), a line is stated to have certain properties which relate it to other lines and points. For example, for any two distinct points, there is a unique line containing them, and any two distinct lines intersect in at most one point. In two dimensions, i.e., the Euclidean plane, two lines which do not intersect are called parallel. In higher dimensions, two lines that do not intersect are parallel if they are contained in a plane, or skew if they are not. Any collection of finitely many lines partitions the plane into convex polygons (possibly unbounded); this partition is known as an arrangement of lines. Lines in a Cartesian plane or, more generally, in affine coordinates, can be described algebraically by linear equations. with fixed real coefficients a, b and c such that a and b are not both zero. Using this form, vertical lines correspond to the equations with b = 0. There are many variant ways to write the equation of a line which can all be converted from one to another by algebraic manipulation. These forms (see Linear equation for other forms) are generally named by the type of information (data) about the line that is needed to write down the form. Some of the important data of a line is its slope, x-intercept, known points on the line and y-intercept. ). This follows since in three dimensions a single linear equation typically describes a plane and a line is what is common to two distinct intersecting planes. Unlike the slope-intercept and intercept forms, this form can represent any line but also requires only two finite parameters, θ and p, to be specified. If p > 0, then θ is uniquely defined modulo 2π. On the other hand, if the line is through the origin (c = 0, p = 0), one drops the c/|c| term to compute sinθ and cosθ, and θ is only defined modulo π. (where λ is a scalar). A ray starting at point A is described by limiting λ. One ray is obtained if λ ≥ 0, and the opposite ray comes from λ ≤ 0. In three-dimensional space, a first degree equation in the variables x, y, and z defines a plane, so two such equations, provided the planes they give rise to are not parallel, define a line which is the intersection of the planes. More generally, in n-dimensional space n-1 first-degree equations in the n coordinate variables define a line under suitable conditions. The direction of the line is from a (t = 0) to b (t = 1), or in other words, in the direction of the vector b − a. Different choices of a and b can yield the same line. Three points are said to be collinear if they lie on the same line. Three points usually determine a plane, but in the case of three collinear points this does not happen. has a rank less than 3. In particular, for three points in the plane (n = 2), the above matrix is square and the points are collinear if and only if its determinant is zero. Equivalently for three points in a plane, the points are collinear if and only if the slope between one pair of points equals the slope between any other pair of points (in which case the slope between the remaining pair of points will equal the other slopes). By extension, k points in a plane are collinear if and only if any (k–1) pairs of points have the same pairwise slopes. The points a, b and c are collinear if and only if d(x,a) = d(c,a) and d(x,b) = d(c,b) implies x=c. However, there are other notions of distance (such as the Manhattan distance) for which this property is not true. In the geometries where the concept of a line is a primitive notion, as may be the case in some synthetic geometries, other methods of determining collinearity are needed. a directrix, whose distance from a point helps to establish whether the point is on the conic. In the context of determining parallelism in Euclidean geometry, a transversal is a line that intersects two other lines that may or not be parallel to each other. asymptotes, which a curve approaches arbitrarily closely without touching it. For a convex quadrilateral with at most two parallel sides, the Newton line is the line that connects the midpoints of the two diagonals. For a hexagon with vertices lying on a conic we have the Pascal line and, in the special case where the conic is a pair of lines, we have the Pappus line. Parallel lines are lines in the same plane that never cross. Intersecting lines share a single point in common. Coincidental lines coincide with each other—every point that is on either one of them is also on the other. Perpendicular lines are lines that intersect at right angles. In three-dimensional space, skew lines are lines that are not in the same plane and thus do not intersect each other. In many models of projective geometry, the representation of a line rarely conforms to the notion of the "straight curve" as it is visualised in Euclidean geometry. In elliptic geometry we see a typical example of this. In the spherical representation of elliptic geometry, lines are represented by great circles of a sphere with diametrically opposite points identified. In a different model of elliptic geometry, lines are represented by Euclidean planes passing through the origin. Even though these representations are visually distinct, they satisfy all the properties (such as, two points determining a unique line) that make them suitable representations for lines in this geometry. Given a line and any point A on it, we may consider A as decomposing this line into two parts. Each such part is called a ray (or half-line) and the point A is called its initial point. The point A is considered to be a member of the ray. Intuitively, a ray consists of those points on a line passing through A and proceeding indefinitely, starting at A, in one direction only along the line. However, in order to use this concept of a ray in proofs a more precise definition is required. Given distinct points A and B, they determine a unique ray with initial point A. As two points define a unique line, this ray consists of all the points between A and B (including A and B) and all the points C on the line through A and B such that B is between A and C. This is, at times, also expressed as the set of all points C such that A is not between B and C. A point D, on the line determined by A and B but not in the ray with initial point A determined by B, will determine another ray with initial point A. With respect to the AB ray, the AD ray is called the opposite ray. Thus, we would say that two different points, A and B, define a line and a decomposition of this line into the disjoint union of an open segment (A, B) and two rays, BC and AD (the point D is not drawn in the diagram, but is to the left of A on the line AB). These are not opposite rays since they have different initial points. In Euclidean geometry two rays with a common endpoint form an angle. The definition of a ray depends upon the notion of betweenness for points on a line. It follows that rays exist only for geometries for which this notion exists, typically Euclidean geometry or affine geometry over an ordered field. On the other hand, rays do not exist in projective geometry nor in a geometry over a non-ordered field, like the complex numbers or any finite field. In topology, a ray in a space X is a continuous embedding R+ → X. It is used to define the important concept of end of the space. A line segment is a part of a line that is bounded by two distinct end points and contains every point on the line between its end points. Depending on how the line segment is defined, either of the two end points may or may not be part of the line segment. Two or more line segments may have some of the same relationships as lines, such as being parallel, intersecting, or skew, but unlike lines they may be none of these, if they are coplanar and either do not intersect or are collinear. The "shortness" and "straightness" of a line, interpreted as the property that the distance along the line between any two of its points is minimized (see triangle inequality), can be generalized and leads to the concept of geodesics in metric spaces. ^ In (rather old) French: "La ligne est la première espece de quantité, laquelle a tant seulement une dimension à sçavoir longitude, sans aucune latitude ni profondité, & n'est autre chose que le flux ou coulement du poinct, lequel […] laissera de son mouvement imaginaire quelque vestige en long, exempt de toute latitude. […] La ligne droicte est celle qui est également estenduë entre ses poincts." Pages 7 and 8 of Les quinze livres des éléments géométriques d'Euclide Megarien, traduits de Grec en François, & augmentez de plusieurs figures & demonstrations, avec la corrections des erreurs commises és autres traductions, by Pierre Mardele, Lyon, MDCXLV (1645). ^ Faber, Appendix A, p. 291. ^ Faber, Part III, p. 95. ^ Faber, Part III, p. 108. ^ Faber, Appendix B, p. 300. ^ Bôcher, Maxime (1915), Plane Analytic Geometry: With Introductory Chapters on the Differential Calculus, H. Holt, p. 44, archived from the original on 2016-05-13 . ^ Technically, the collineation group acts transitively on the set of lines. ^ On occasion we may consider a ray without its initial point. Such rays are called open rays, in contrast to the typical ray which would be said to be closed. Wikisource has the text of the 1911 Encyclopædia Britannica article Line. Wikimedia Commons has media related to Lines. Weisstein, Eric W. "Line". MathWorld.